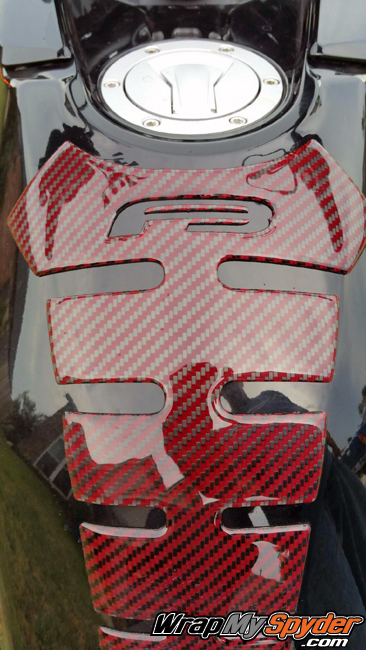 Add protection and style on your tank with our new F3 Spine tank protector. 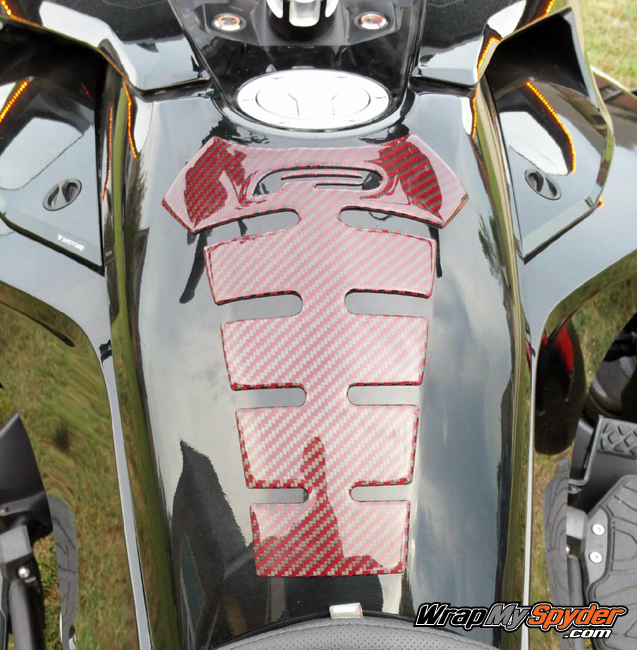 This kit is produced from the same high quality materials as our dash kits. 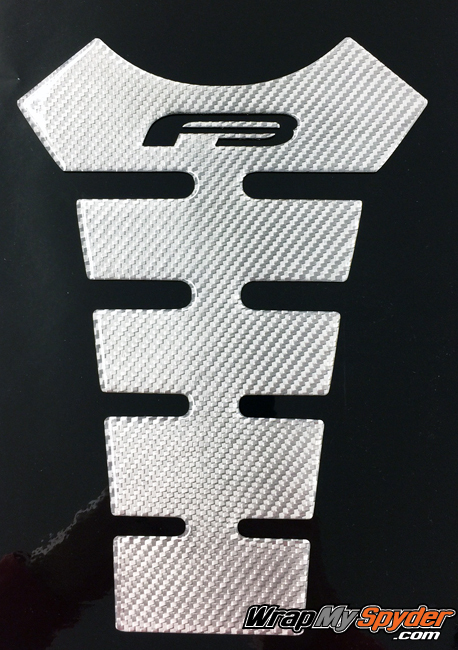 Easy peel and stick, no drill application with our 3M acrylic attaching system. 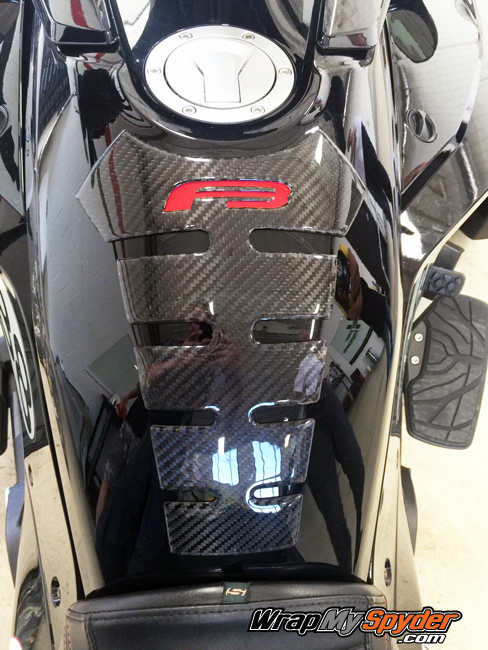 For the completely finished look from your handle bars to seat add our F3 Dash kit in a matching finish. 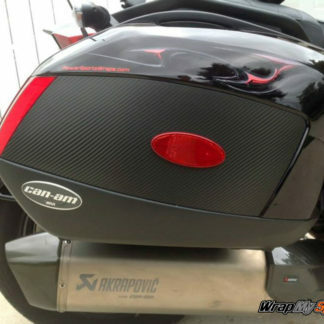 To further customize the look choose a vinyl color to apply on the tank before you install the kit. This will make the F3 text stand out with the color of your choice. See drop down (F3 Spine Optional Text Color). Standard Red was added in the photos for this product. See a short video of this kit in the tab at the bottom of the page. 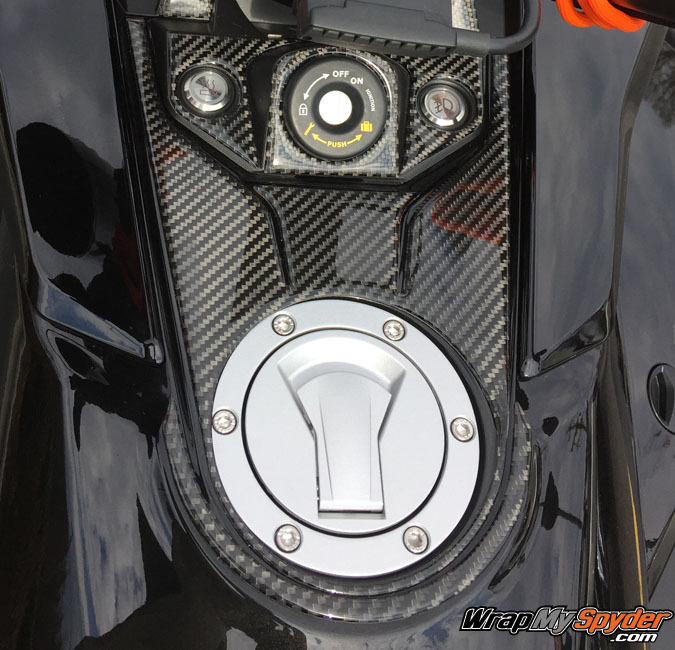 The 5pc Gas Filler Kit consists of: Gas Filler Surround, Half Moon, Keyhole, Left/Right Switch pieces. See photo at left. View Application Tutorial: F3 Tank Protector Application Instruction Sheet. 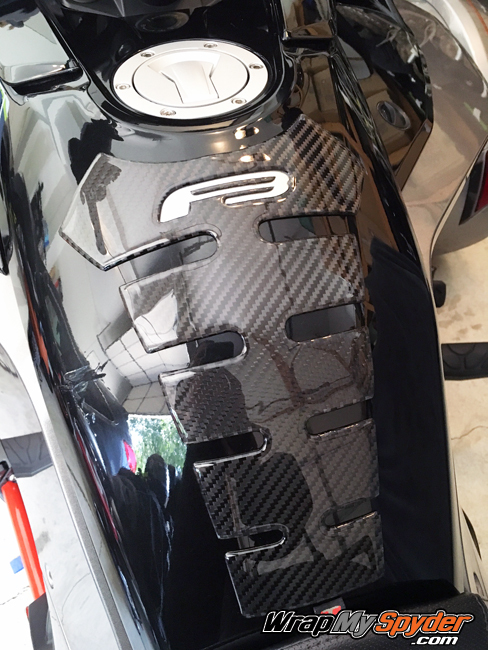 Finish refers to the actual Tank Protector material. Would you like to add the 5pc Gas Filler Kit? 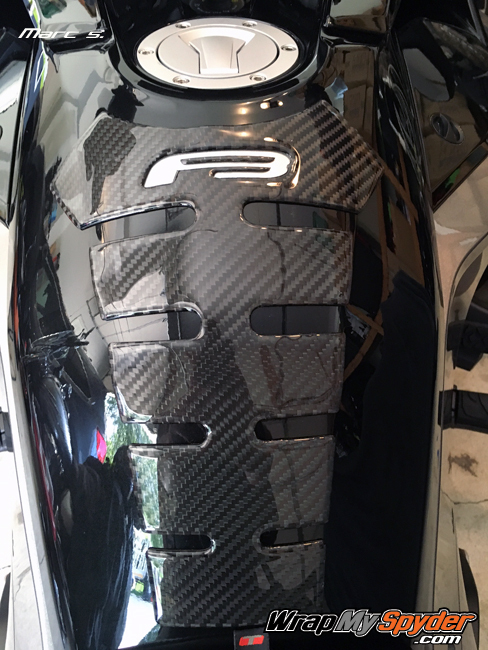 I have the F3 Spine Tank Protector and pleased with the product. Excellent quality. 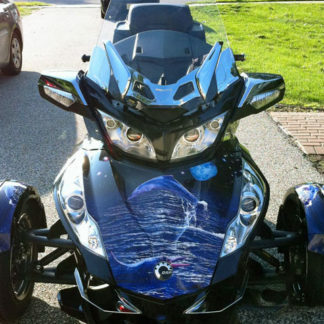 Good compromise between protection and aesthetics. More important to me, their staff is very easy to work with and accommodating. Very high quality and the service/support is excellent. Pete answered all my questions before I bought as this would be the first time I ever installed something like the spine protecter. Delivery was super fast and was impressed immediately in the quality and excellent color step by step instructions. The key to the install is reading the instructions completely a couple of times before you start the install, taking your time (especially if you’ve never installed something like this before, like me), and making sure, as the instructions say, the area was not recently waxed and you clean the area where you will install it with rubbing alcohol. 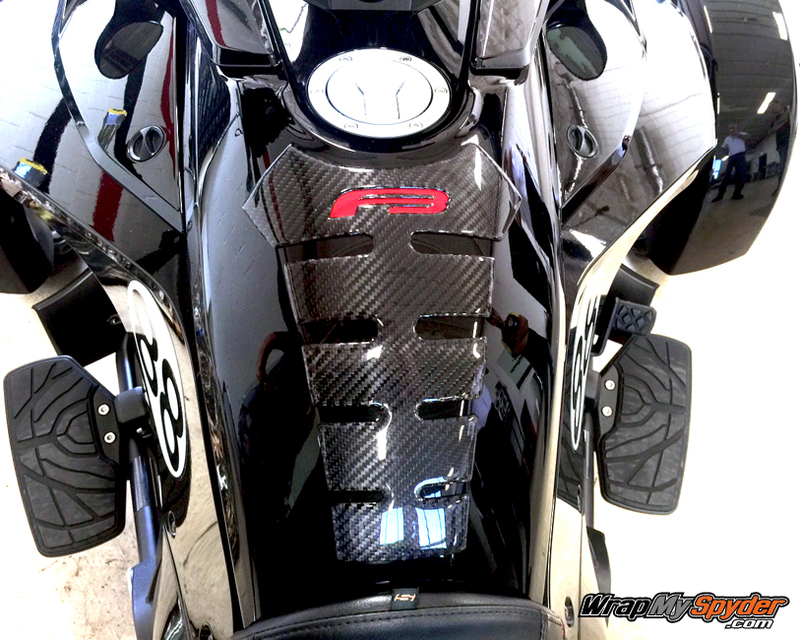 This does not harm the paint, but removes any residue or wax making the protector stick firmly to the bike. Make sure area is completely DRY before installing. 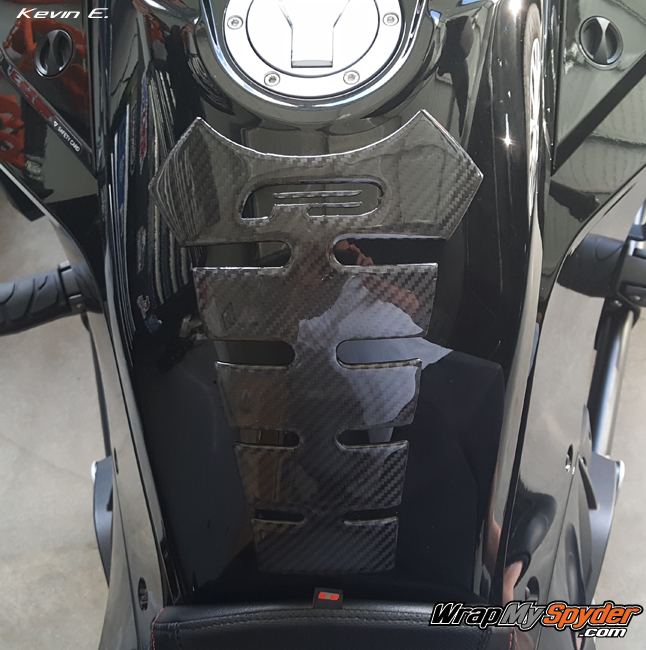 End result is you will have an awesome looking tank protecter that adds a lot to the look of the bike while also protecting the bike from scratches and scuffs (eg., jeans, zippers, etc.). Thanks again to Pete who answered all my questions, responded to my emails super quick with great advice on how to make the install painless, and for making such an outstanding product that’s worth it’s cost for sure!!!!! Ordered the product, Received well packed and service was exceptional. 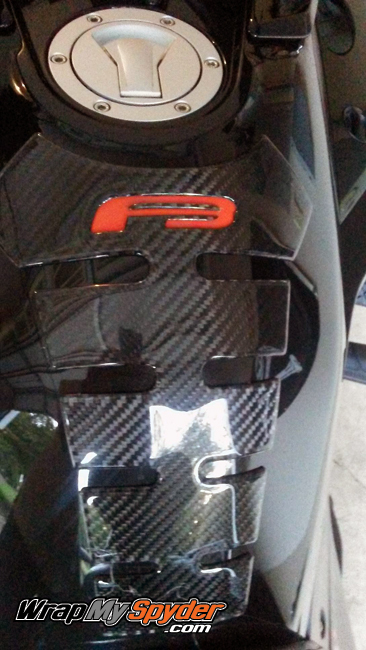 I purchased the Red/Black Carbon Fiber F3 Spine Protector. 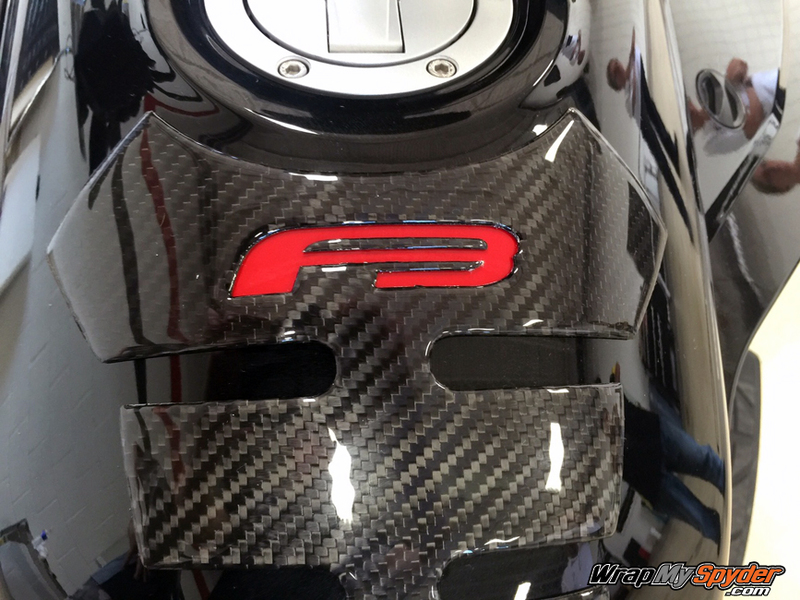 Well made product and does a great job protecting my bikes finish. 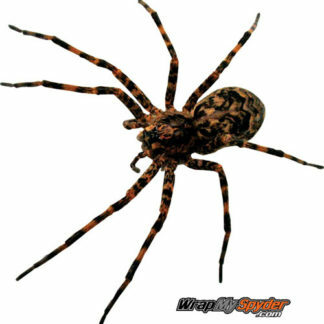 The product is head and shoulders above any other protector product that I have considered. It is well worth the money. 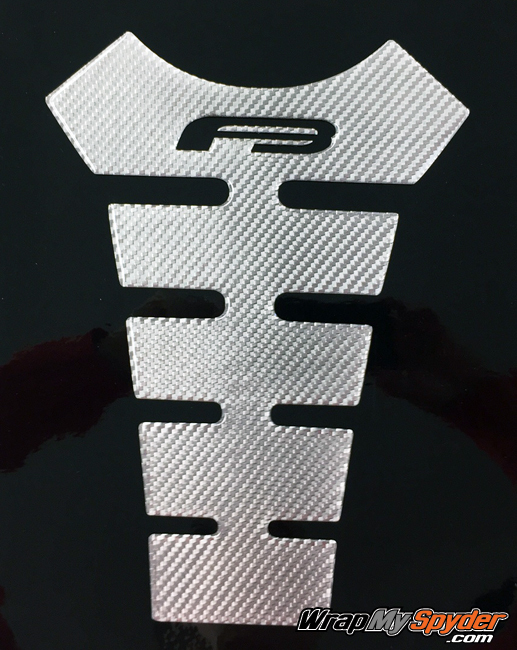 Now I must say the Spine Tank Protector is some GREAT stuff.. Very durable and so easy to install.. 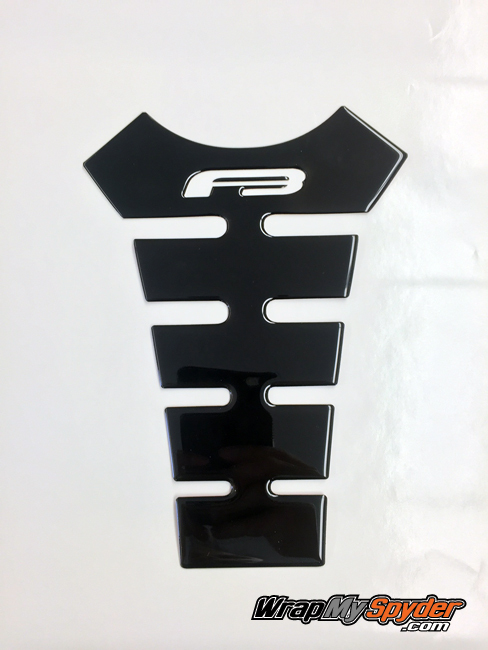 I know a lot of you hesitate to get this stuff simply because you are scared to install it–Don’t be it is easy as 1,2,3… I Love it and it makes the spYder kind of stand out a bit.. Great product. 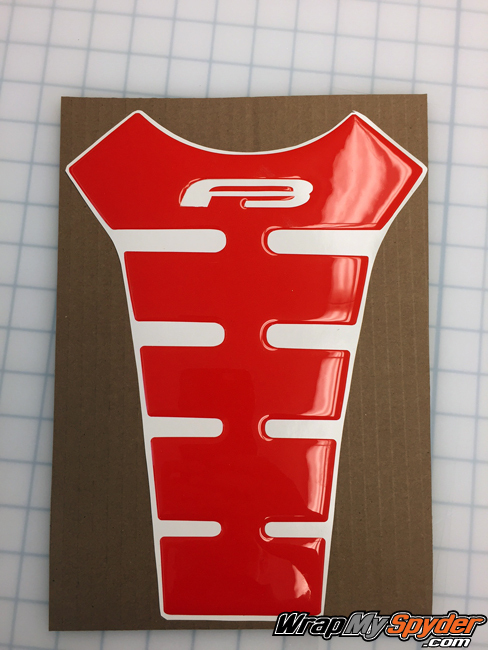 This Spine Tank Protector is great. I know it’s going to do the job I purchased it for. 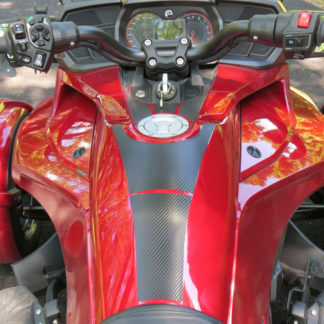 Easy to install and really dresses up the Spyder Tank. Don’t hesitate on buying you won’t be sorry! The Spine Protector is great. The purple I was sent was exactly what I wanted/needed. Easy to install. This company is great to work with. Fast delivery and great products. I bought another tank protector from a different company to which didn’t meet my expectations. The color is not black but more gray. When I received this protector, it was exactly what I wanted and better quality than my previous one. Pete really made the purchase easy with his great customer service. Thanks a million! 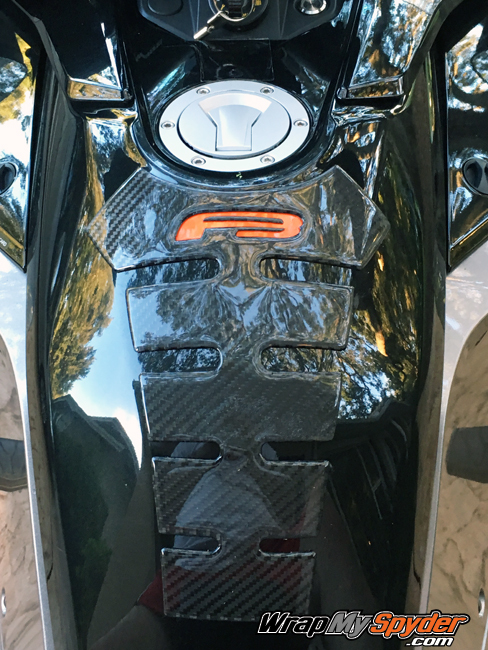 I have the Real carbon fiber Black on a white F3-T. Love the look as you can see it but it is not over powering. Offers nice protection while looking cool. 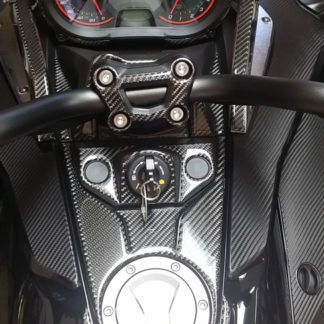 I also added the carbon fiber dash kit to complete the look, along with the carbon fiber hood spears kit, knee protection kit and the fender top kit. The bike looks totally different unique. Just took my time and everything worked out perfectly. If you have any doubts about this DIY it really is easy.